Bitter cold penetrates with a chill that cannot be dispelled, as we waddle along the trail, bundled in thick layers of clothing, clumsy burdensome snowshoes stealing all grace from our walk. Steaming clouds of frosty breath trail behind. Crusty snow emits weird squeaks and groans as our toes dig in. We stop for a breather, at a vista overlooking the valley. Night in the deep woods is silent and brooding dark, swathed in a blanket of snow. Nature's array is spread forth before us in the moonlight, hundreds of acres of evergreen pines and spruces and firs, looming black and secretive in the still night air, climbing the hillsides and standing stern and motionless sentinels along the ridge tops. Crossing a thick stand of brush, we stumble across a resting elk, who springs up in alarm at the disturbance. Which of us was frightened more? With sweeping strides and massive power, plunging headlong through the undergrowth at a thundering gallop, he escapes from our threat, and is gone from view almost before we realize what we are looking at. We stand there for a moment in amazed silence, gaping at each other like wondering fools. Later on, crossing our trail like a silent wraith, a red fox flashes by and disappears into the chaparral. From time to time we hear a great owl, his muffled query floating across the dark forest, as he glides through the night sky, scanning the snow for prey. We are the strangers here. This is no longer our world, we find no warmth in nature. We have too long allowed ourselves to be enticed away, wrapped in the insulating comfort of technology. In our complacence, we have been robbed of natural rapport with the forest. Now we stumble as aliens through this seemingly stark wilderness, interlopers for an hour, feeling as if we could barely survive a few miles trek through this unfriendly locale. To every creature of the forest, we are a threat and a foe. We don't belong. In the end, we circle back to the car, arriving in relief back at civilization, anxiously looking forward to the comforts of home, and a long hot shower. I think the fresh snowfall represents renewal. It is a tangible representation of the repentance process. New snow erases the old tracks and ruts, leaving a cold, clear surface upon which to begin again. It is a symbol of surpassing whiteness and purity, so clean and pristine. Waiting to receive whatever new impressions may come, tracks laid down over the smooth white surface. 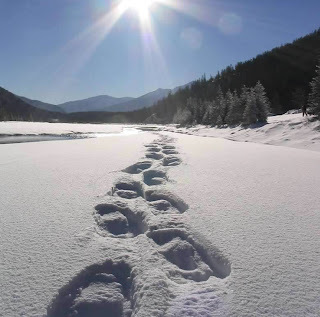 The snow uniquely records our passages and progress, the trail a chronicle of coming and going embedded in icy footsteps. In my back-yard treks, I follow an established snowshoe trail climbing up to the nearby summit of the mountain. I have found that after each new storm it is far easier to follow the old track to the top, rather than break from the trail on a new course. Under the top layer of unpacked powder, the firmer base of compressed snow offers better support for my ponderous advance. Over the past couple of months, my tracks through the snow have gathered in wandering footsteps of nearly every other creature happening by. Rabbits. Birds. Deer and elk follow the path, herd animals filing serially, each carefully placing feet precisely into the steps of the leader. I never see these creatures in the flesh, but they leave their tracks. I have been mighty curious about how the "footed-ness" of these animals might affect their gait. Do clumsy inept deer ever have trouble staying inside the lines? To my amusement, I sometimes find signs that these animals have as much difficulty navigating through the deep drifts as I. Occasional deep belly-marks. Errant tracks that diverge from the path, then join back. Though I suppose that with them, it is no laughing matter to forage in the desperate cold and barren winter-clad slopes seeking food. I wonder about whatever unidentified dog-like creature happens to own those frighteningly large canine feet that also trail along in my footsteps. Sometimes the snow records the signs of their predation. Scattered tufts of fur and feathers. Bit of bones. Crimson blood spilled on the cold white snow. How much can such animals read from the tale of _my_ three-foot long treads. Are they ever watching me from among the trees along the bluff? Do they ever follow the scent of my slow and labored passage and dream about spilling more hot blood onto the cool clean snow?